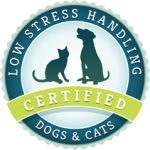 We are fortunate to have a compassionate, dedicated staff to assist you and your pet during your visits. The doctors and groomer may get more recognition for a job well done, but without our fantastic support staff, we could not offer the same quality of care. Some members of staff may go unnamed here, but each and every person at Tidewater Trail is valued for their work. I am a Virginia native, I moved to California when I was 5 yrs old. I became a dog groomer and started managing a Boarding Facility by the age of 17. In 2007 I returned to my Va roots. I started working at TTAH in 2008 as the Doggie Daycare Supervisor and became Office Manager in 2014. I have been a dog owner and lover my entire life. I acquired my first Boxer Jax a little over 5 yrs ago. The bond between the two of us in incredible. I fell in love with the breed and acquired two more Boxers. I also own an elderly Pug and a moody little Chihuahua. I am known around the Hospital as the Crazy Boxer Lady. On my free time I enjoy cooking, spending time with my kids, family and friends. I look forward to meeting you and your Pet. Meghan Eastman, formerly Meghan Davis is one of the original Tidewater Trail Animal Hospital team. She has been with us for 14 years. She is an experienced groomer, taking care of all breeds of cats and dogs. I am originally from Berlin, Germany and worked as a licensed practical nurse. In my 20s, I met my husband, an American in the military. We moved to American and I spent several years raising our son. In 2004, it was time to go back to work. I got a job at an animal hospital and have continued working with animals throughout all our moves. Working with animals is like second nature to me, and I feel like I am making a difference. I started working at TTAH in 2014 as a receptionist and then was promoted to Doggie Daycare Supervisor. In my free time, I enjoy horseback riding, spending time with my family and spoiling our three pets: Lola and Bella, our Yorkies and Jingles, our cat, who believes my purpose in life is to wait on her. Working in a veterinary setting has been a dream of mine since I was a little girl. I have always found veterinary medicine and animal anatomy fascinating. I have had the honor of working at TTAH for 4 years now. I take pride in my position as front end supervisor and treat each client that comes through our doors as family. I am a mom of 2 dogs: Cooper, a black lab, and Lilo, a rescue pit bull. I also have a sassy cat named Boujee, who I brought home one day after she was dropped off by the dumpster at work. These three have changed my life for the better. I could never imagine a life without animals. When I am not at work, I enjoy spending time outdoors with my husband and making the best of life. My name is Tabetha Krieglstein-Mekeel and I have been working at Tidewater Trail Animal Hospital for over 8 years now. I am originally from Germany but moved here when I was 9. I have always had a love and passion for animals and am blessed to be doing what I've always loved. I have been married for 6 years and have a beautiful baby boy named Elias. I also have 1 rotten 3 legged cat named Tigerlillie who is amazing since she deals with my toddler and doesn't ever get mad when he gets a little too much for her! Emily has over 15 years expirience in the veterinary field, eight of which have been with Tidewater Trail Animal Hospital. Her compassion and attention to detail are an intergrel part of the excellent care you can expect from us. I was born and raised in Stafford, VA. Graduated from Stafford High School in 2012. I have always had a love for animals ever since I was little. That love has grown since I started at TTAH in August 2013. I am currently in the veterinary technician program at Penn Foster in order to get my LVT. Looking forward to many more years here at Tidewater! When I’m not working I love spending time with family and my 3 fur babies: Fuel, a 3 year old Doberman, Mariah, a 2 year old Pit mix , and Bertha, a 9 year old DSH cat.